Tobacco plants pioneering the production of monoclonal antibodies for an experimental Ebola treatment turned out to be quite the head scratcher for last Thursday’s WEEKLY readers. With tobacco’s reputation polluting our recent memories, let’s take a fresh look at tobacco and biologics. To date, no approved therapeutic protein has been produced in whole plants—ever! In 2012, Israeli company Protalix successfully earned FDA approval for its plant cell produced drug ELELYSO, a recombinant version of the glucocerebrosidase (GCD) enzyme deficient in Gaucher’s disease patients. This nod from the FDA demonstrates that plant cells do have the ability to produce complex, therapeutically functional human proteins. Taking a walk on the animal side, remember it is the mammalian cell line—Chinese Hamster Ovary (CHO) cells—that are the cell of choice for production of most complex protein therapeutics, such as monoclonal antibodies. Biologics produced in plant cells are more cost effective than mammalian cells. Biologics produced in whole plants are an even thriftier solution. Planet Biotechnology (Hayward, CA) for dental caries (tooth decay) and common cold. Mapp Biopharmaceuticals (San Diego, CA) for diarrhea (caused by Clostridium difficile), AIDS, and Respiratory Syncytial Virus (RSV) infection. University of Louisville, Kentucky Bioprocessing / Intrucept Biomedicine (Owensboro, KY) for AIDS. Using genetically engineered mammalian cells to produce biologics—thousands of liters in carefully monitored production tanks—is a pricey proposition. Producing the same amount of drug in whole plants (or plant cells) keeps spending in check. Additionally, plant production capacity can be quickly scaled to meet demand. Trumping everything, producing human therapeutics in plants is considered to be the safest option since it is unlikely any human pathogen could infect a plant. Mammalian cell lines can and do become infected with human pathogens. Tobacco plants, oddly enough, are the most commonly used plant for therapeutic protein production. Cultivated by humans for centuries, researchers have studied one of the tobacco plant’s most common viral afflictions—TMV, or tobacco mosaic virus — and as a result, it is one of the most well understood viruses. This plant, with its hand in countless premature deaths, may prove a boon to public health as it may enable cheaper, faster production of life-saving therapeutics. The dreaded cold. Why is there no cure? Simply put, it is too expensive to produce a cure via conventional biomanufacturing. However, tobacco plants may be the answer to our collective winter woe. The ICAM-1 is the gateway receptor in which the rhinovirus invades our respiratory tract cells. One potential treatment is soluble receptors—engineered versions of the ICAM-1 receptor. When these man-made ICAM soluble receptors are placed in the vicinity of the rhinovirus, they are able to attract and “mop up” the cold virus before it can hook onto and enter respiratory cells. 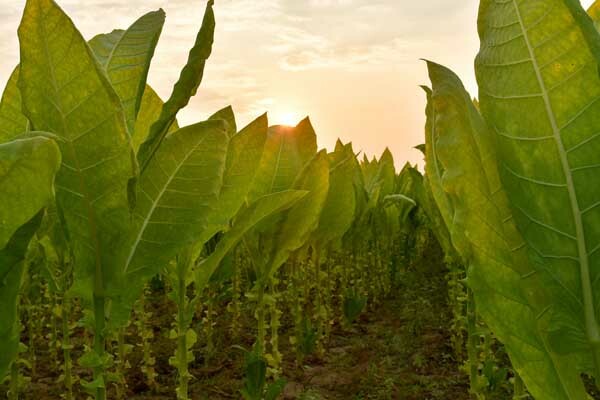 Since Planet Biotechnology’s tobacco plant platform technology is able to produce ICAM soluble receptors, an inexpensive biomanufacturing option may help make the cure for a common cold a reality. Biomanufacturing is the use of living cells to produce a product. Typically, the term refers to the use of large volumes of genetically engineered cells, such as E. coli bacteria or mammalian cells such as Chinese Hamster Ovary (CHO) cells, to produce a product. Engineering plants to produce a therapeutic or vaccine is another type of biomanufacturing sometimes cleverly referred to as biopharming. Researchers are cooking up the possibility of edible vaccines delivered via bioengineered fruits and vegetables. Preliminary positive results have been achieved with edible vaccines for cholera in bananas and HBV in potatoes. The gut contains specialized immune cells capable of detecting specific antigens which are not destroyed by the digestive process and then activating other immune cells to target those antigens. This research is still mostly at the preclinical stage, but it offers up the tantalizing possibility of engineering food items to contain an immunogenic antigen. Icon Genetics’ (Halle, Germany) tobacco plant produced non-Hodgkin’s lymphoma vaccine has successfully completed Phase I clinical studies. The gene, encoding the patient-specific tumor antigen, is used by the plants to produce the personalized vaccine. The expressed protein is extracted from leaves and injected into the patient in order to boost their immune response against cancer. Medicago (Quebec and Research Triangle Park, NC) also tumbles into the mix with a plant-produced influenza vaccine in Phase II clinical studies.